Exploding Doughnut: "Frida Kahlo is feelin' blue....."
"Frida Kahlo is feelin' blue....."
If you read my previous post, I mentioned my best friend's birthday was last month. Here is one of the gifts I gave her. She absolutely loves Frida Kahlo! Frida Kahlo was a famous Mexican painter who became known for her very personal self portraits....basically putting herself into her art. I really wanted something original though. A standard print or postcard just would not do! So I went to a copy shop and made a two color copy (not a full color) of one of Frida's strongest paintings found in an art book. My friend loves blue jewel tones, so I made a black and cyan colored copy and voila!....an original blue Frida by Dean!! 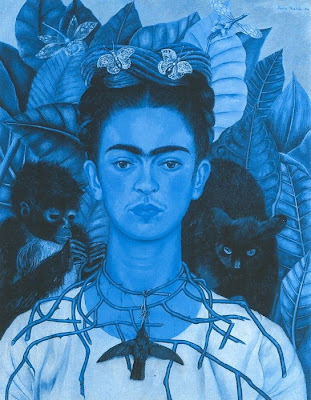 The colors came out beautifully and once framed, the one-of-a-kind "blue Frida" made a great gift! This post immediatly caught my attention as I'm a Frida big fan! She was one of my inspirations to visit Mexico. I've been to her house at Coyoacán (Mexico City) and I simply loved it! Oh! I'd LOVE to see her house in person! "Green Pear on Red Floral Cloth"